New Year – New Room! Why not. No one can deny that colours are emotive, so what better way to make your room look and feel better than with a splash of colour? Here at The Parlour we exclusively use Annie Sloan Chalk Paint. Her palette of colours is very broad and with a little dexterity you can literally create any shade you desire by mixing them together. The only limit is your imagination! Most of us are a little bit apprehensive when experimenting with bold colours in our home, so we tend to stay in the safe zone with simple neutrals (nothing wrong with neutrals by the way - I write this from my grey, cream and duck egg blue dining area!) However - do not be afraid of the colour-wheel, fellow home-makers! Let the Parlour Maids guide you…...through the wonderful wheel of colour!! The colour wheel may appear a tad mystifying at first glance, but essentially the basic rules of colour matching are really very simple. Choosing a bold colour for your room can be fun and refreshing, and can bring the whole room together. 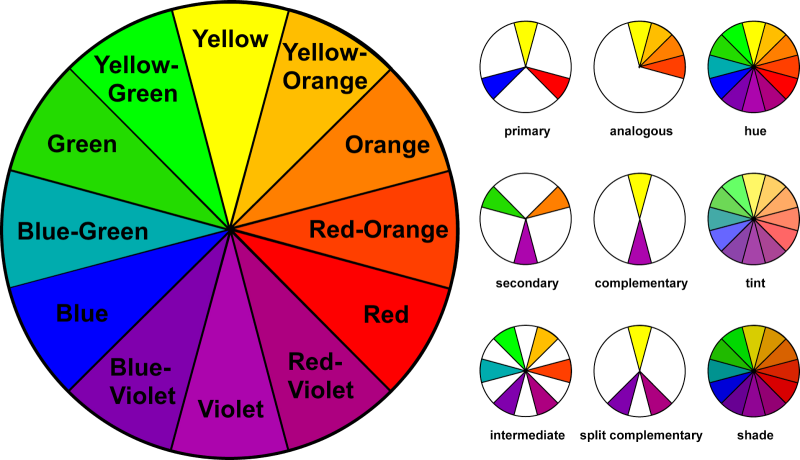 According to colour theory, complementary colours are any two colours opposite each other on the wheel. This creates a stunning dramatic look and is great for when you want a piece of furniture to stand out for maximum drama! Ideally, you can use one colour as background and the other as accents. For example, a blue dresser against an orange wall! See how fabulous this looks!? Not scary at all. Of course, if we prefer, we can use tints and shades of the wheel such as a lighter tint of blue against a darker orange. Why stop there? You can also use any three colours equally spaced around the colour wheel forming a triangle. As if by magic – these colour schemes remain harmonious regardless of the rotation angle around the wheel! See!??? How did we ever decorate a room without the colour wheel!? Here’s a good cheat; Take one colour and match it with the two colours adjacent to its complementary colour. For example, blue, yellow-orange and red-orange. This scheme is ideal for beginners because it is difficult to mess up. That's because you get contrasting colours - but they aren't as diametrically opposite as complementary colours. 1. More than one colour in a room looks great, but don’t go mad – keep it to 3 colours max. If you’ve chosen two bold colours, be sure to choose a softer natural colour for the third to give your eyes a break. 2. Start by selecting your boldest colour and then choose the others with the first colour in mind. 3. Don’t be afraid! Paint is not permanent! You can always change it again next season! There's an app for everything; SwatchMatic for Android identifies any colour you point your camera to and suggests which colour to match it with using the basics of the colour wheel! For iPhone, ColorSnap is good. Right then, off you go to Ace for that magnificent navy-blue paint for the hall, and don't forget the Parlour Maids are here to assist you with that hall table to be painted in that beautiful vibrant green that really makes you smile! Are you a chick with wanderlust who loves the beach? Why not bring some azure blues, yellow sunny hues and a whimsical beachy feel to the furniture in your room? Do you love the great outdoors? Bring some greens and earthy browns in to your room. Are you an adrenaline junky? Give a pop of red or yellow to spice things up! Annie Sloan’s palette of colours is broad and with a little skill can create literally any shade you desire by mixing them together. The smooth texture of the paint and the intensity of the pigment means that a little goes a long way. How do certain colours make you feel? Colours are emotive. Like a song you heard years ago, it can take you back to one specific place – perhaps a wonderful holiday…? Some say yellow brings the sunshine in to the room and increases serotonin levels. For me when I am painting with the dreamy mix of Annie Sloan’s Duck-egg Blue and Old White, the soft, cool, minty green colour literally makes me smile. Like eating an entire batch of peppermint creams when I was a child. Red emanates strength and confidence and can look utterly amazing with pinks and greys. Blue can be cool and breezy or dark and moody and can be paired with oranges and greys to make it pop. Green can make you feel alive and happy when together with yellow or black. Annie Sloan recently inspired us to write this blog when she posted an image on Instagram showing a number of different coloured furniture against different coloured walls. Proving that some colours you think would never work together, actually do. We heart the mustard yellow against the dark blue wall! In summary, I believe your interior style should A; make you feel happy, B; reflect your personality and C; set the mood you want for the space. Go on I dare you. Go for Bold! Check back for our next blog on how to use a colour wheel to choose complementary colours to create either a dramatic or more subtle colour scheme in your room. There are some fabulous pieces of furniture out there, pieces that we can easily attach ourselves to emotionally but this is particularly the case with inherited furniture. It may be a piece that the relative wanted you to have or indeed pieces that you have grownup with and cherished and simply had to have them in your home. These can often range from antique, solid, gaudy or even bashed about old pieces that hold a very special place in your heart. Which sparks the debate....... is it right to change it from its original state into something different? Many would argue no, that the piece should remain untouched in its original state. It is of course a personal choice however, my recommendation would be quite the opposite for actually adapting these inherited pieces with a view to you enjoying and appreciating them even more. Whilst a lot of these original pieces can be fitted into the home, the chance is more likely that they do not actually fit with your current décor, why not adapt the piece for your home to give it a whole new look. Currently I follow and never cease to admire, Jonathan Marc Mendes, a fellow furniture artisan and artist who continues to inspire me daily with his fabulous creations, with his artistic vision for pieces he captures so beautifully the spirit of many of these older style pieces and stories literally unfold before your eyes, he is able to give a beauty and transform pieces to make them extra special and you cant help but fall in love with everything he touches. Annie Sloan herself obviously holds Jonathan's work in high regard as she has announced this week that he is to become her next 'Painter In Residence' which sees truly talented individuals working on projects for Annie's social media profile and being supplied with the materials to come up with inspirational pieces to help motivate and share ideas with others, which Jonathan has already been doing himself for a while. As we speak I am working on a very old chest for a customer, which was actually the inspiration for writing this blog. The lady turned up with what can be described as a rather battered box belonged to her late grandmother which she holds dear, desperate to make use of it and for it be fit proudly within her home, the brief was to give it a new meaning of life. In trying to keep the chests makeover true to its rustic charm it is now adapted to become a functional piece within the home and matches the customers décor. How to Style your Coffee table like a Pro! Challenge The Stylist Part 1! So I thought it would be fun to bring Interior Stylist, Ash Young of Adore Décor in to The Parlour one morning and challenge her to style Tommy our handsome Old White and Paris Grey coffee table... I called it Challenge The Stylist! - Here's what happened! "Coffee tables are central to most living rooms and can be dressed to add personality and style to the space. An easy starting point is to include books which, as well as looking chic, can help add height to your display. Fashion, design or photography titles usually have cool covers and can also serve as conversation pieces. Ash at work in The Parlour... doesn't Tommy look fantastic! Try placing additional accessories on a tray and including the elements of light (candles), life (a plant or flowers) and sculpture (other small decorative pieces). Group smaller objects in 3s which, aesthetically speaking, is the magic number. Strike a balance between including items of different sizes, textures and styles so that the overall effect is organic and interesting, while also ensuring a relationship between them so that it doesn't look too busy. The easiest way to do this is to work with a tight colour palette although it can also be achieved by sticking to an over arching theme. Finally, don't let ugly remote controls spoil your efforts. Storing them in an attractive box will both keep the space beautiful and minimise the amount of valuable Netflix time lost to finding them!" Bringing Furniture to Life - with ART! So it’s fair to say I have definitely discovered my love for painting and being creative, hence The Imperfect Parlour, but I have to be honest and say I was never good at art or painting at school. It is something that has crept up upon me in later life!! I have always been in complete awe of the people that can really paint, put brush to canvas and create beautiful unique artwork. So I asked myself the question; Does beautiful art need to be limited to canvas and displayed on the wall.....the answer; absolutely not!!! Feeling quite passionate about this subject it has seen me come out of my comfort zone somewhat and have a go at blogging on the topic - in an attempt to highlight the true talent and vision that goes into creating such masterpieces. And what better way to do it than on a project for my twins bedroom!! It is then passed over to the lady who will make the magic happen and I have to say I am extremely excited about this, never mind the kids! After the initial coat has been applied, Suzana will go over him again another 2 times adding his details and blending where required. As Marvin begins to take shape, Suzana is enjoying working on him so much that she cannot put down her brush. She continues to work on Marvin for 2 full consecutive days. 24 hours is required before Marvin is later waxed to seal his finish back at The Parlour where he will at least stand a chance of some protection against sticky little hands!!! Et voila!!! What a beauty!!!! Marvin is truly fantastic and we feel sure that the treasure will be well protected in the ocean! If you’re on Instagram or Pinterest you would have noticed that beautiful rustic and chippy furniture is very now at the moment. Personally, I can’t get enough of it. Not everyone is brave enough - but I think ANY room in anyone’s home could welcome one chippy piece. So you’ve got your beautiful piece of furniture (hopefully from The Parlour!) and you’ve put her in her intended spot in the room. She’s gorgeous and you love her. Now what? How do those interior designer folk use accessories to make their statement pieces look so effortlessly chic? I’m no interior designer but I can tell you it’s easy if you follow these tried and tested tips. I miss Beatrice, she was so useful to keep my wine glasses and bottles inside. Shame I sold her. Of course I’m referring to the gaudy, battered retro wine cabinet I picked up at the Dubai Auction last year, not my mother-in-law! I lovingly painted her a charcoal grey-black and a bright turquoise on the inside. She was gorgeous. Stunning even. I’ll probably never get my hands on one like her again.